By Harry Dacres-Dixon in VectorVest on 15th August 2018 . Guernsey based GBGI (GBGI.L) is a leading integrated provider of international beneﬁts insurance, operating globally across over 120 jurisdictions. Trading principally as “The Global Beneﬁts Group” or “GBG”, the Group distributes and underwrites health, life and disability, and travel insurance, with a client base that spans multinational corporations, expatriates, local HNWIs, international schools, non-proﬁt organisations and international students. GBGI is a fully integrated insurance group providing services from policy sales to claims administration and servicing and is committed to delivering high levels of customer service. Since May 2018, VectorVest members will have noted progress on the key RT (Relative Timing) and RV (Relative Value) metrics for GBGI. The RT metric, (a fast, smart indicator or a stock price trend) moved sharply higher in mid-July in line with the subsequent share price moves, and today logs the stock at 1.47 – excellent on a scale of 0.00 to 2.00. The RV metric, (an indicator of long-term price appreciation potential) again has moved sharply higher to register at 1.36, which is very good on a scale of 0.00 to 2.00. And at 18%, GBGI’s GRT (Earnings Growth Rate) metric is also rated as very good by VectorVest . 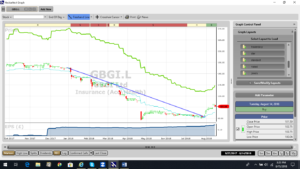 At 104p, GBGI trades at a discount to the current VectorVest valuation of 135p. 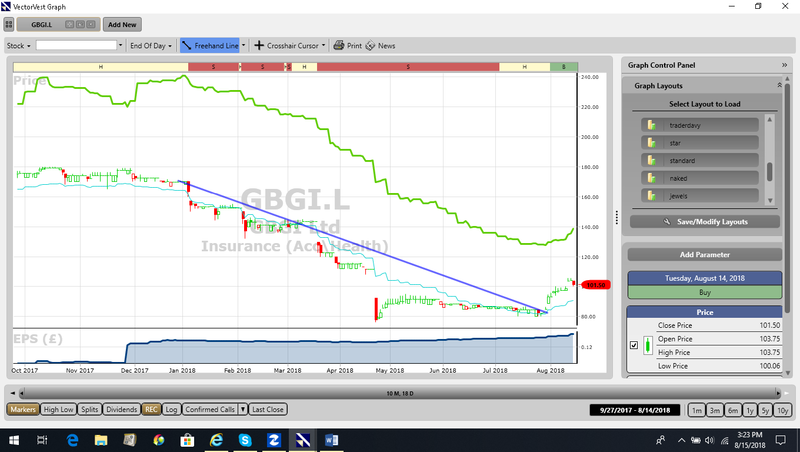 The chart of GBGI.L is shown above over the past 10 months of trading. Earnings per share (EPS) is shown by the blue line study in the window below the price. EPS has grown by 30% over this period. Over the past three months the share has bottomed out and charted a double bottom at the 80p level. The share has broken upwards through a trendline defining the fall in the share price from January to May 2018. The share is on a Buy recommendation on VectorVest since the start of August 2018.